In 1991 an officer of Avon Fire Brigade, David Hutchings, visited The Gambia for a holiday and made contact with the Fire Service there. During his stay, a serious accident occurred and he was invited to attend. He witnessed a family of six die needlessly due to the lack of the most basic equipment. On his return to the UK he canvassed for help by means of the provision of redundant but serviceable vehicles and equipment. David purchased the first two vehicles himself, with a number of companies in the Avonmouth area funding the transportation costs. In 1994 the Public Protection Committee of Avon County Council, led by Cllr. Terry Walker, supported this initiative and began the donation of redundant appliances and equipment. The Gambia has consistently contributed to the shipping costs, but invariably there has been a shortfall which David Hutchings has, to date, managed to make up by canvassing hard for public and corporate contributions. 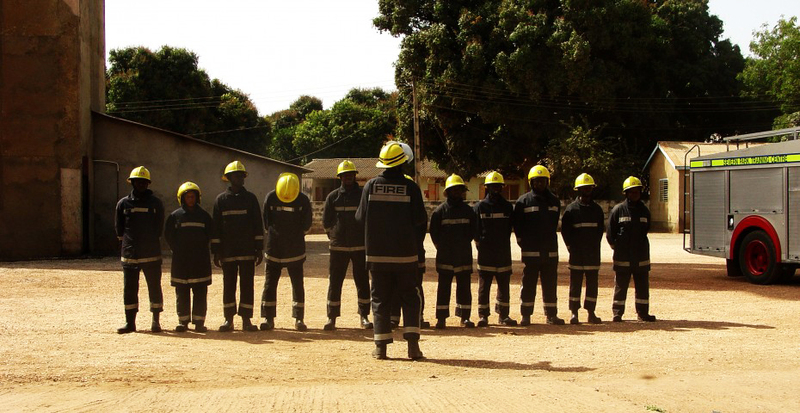 Since the mid 1990’s individual Principal Officers of the Avon Fire and Rescue Service have visited The Gambia in order to reinforce their commitment, whilst simultaneously evaluating future development in terms of need. Following an audit in 2004, the current Fire and Rescue Service management team proposed that a Charitable Trust be established in order to more appropriately facilitate both shipping and visits by specialist trainers. It was anticipated that a successful Trust Fund would greatly assist in securing the long tem future of the partnership. David Hutchings has continued to coordinate and facilitate the activities between Avon Fire and Rescue Service, other supporters in the UK and The Gambia Fire and Ambulance Service since his retirement in 2001. The formation of this Charitable Trust, now known as GAFSIP, was undertaken successfully and this now formalises the previous somewhat ad-hoc arrangements. In addition to support for The Gambia’s Fire and Ambulance Service, there has been a natural development toward the improvement and support of basic health and education facilities. The work of the partnership became an inherent factor in The Gambia’s programmed expansion of Emergency Service provision throughout the country. This natural enhancement has been developed by GAFSIP by establishing a formal link with The Gambian Authorities to provide specific support for education, in liaison with Ndey Bakurin, wife of the Chief Fire Officer of The Gambian Fire and Ambulance Service. Whilst support for education is by no means exclusive to GAFSIP, neither is it intended to be. An opportunity was identified that dovetailed conveniently with the endeavours in support of the Fire and Ambulance Service. It was established, through local enquiries in the former Avon area, that a vast quantity of teaching aids here in the UK have a termed life of use, following which they have to be scrapped, ending up land filled. These materials have no value here in the UK but are of immense value to The Gambia. To this end a considerable effort has been made by a small band of volunteers to seek out, collect and transport these items for re-use. GAFSIP have received considerable support from both State and Public local schools which have kindly donated redundant equipment. The success of this initiative is therefore very evident by visible improvements in The Gambia with an urgent need to increase funding to meet the demand for shipping. GAFSIP does not donate money. Funds are used to provide practical support and the transport of the donated goods in order to assist the Gambian people achieve their own objectives toward self sufficiency. The Gambian Government has invested heavily in this partnership by providing the infrastructure e.g. Fire stations, schools, clinics and the consequent employment. In addition, it contributes each year toward shipping costs. However, its gross national product together with comparable value of its currency dictates that, until matters improve on a global scale, there will inevitably be a shortfall.